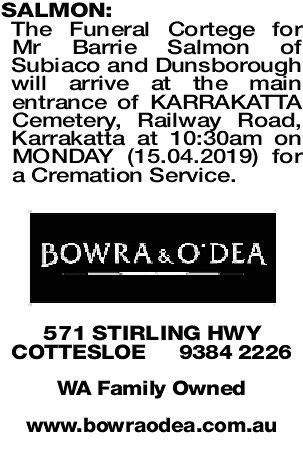 The Funeral Cortege for Mr Barrie Salmon of Subiaco and Dunsborough will arrive at the main entrance of KARRAKATTA Cemetery, Railway Road, Karrakatta at 10:30am on MONDAY (15.04.2019) for a Cremation Service. R.I.P. 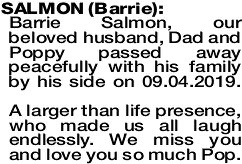 Barrie (Maximus) We had our chats and messages but I never got to meet you face to face, it was always going to be on a road somewhere, or the next Bushtracker get together, sadly that won’t happen. Our deepest sympathy to your wife and family. 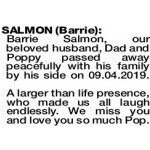 SALMON BARRIE Barrie Salmon, our beloved husband, Dad and Poppy passed away peacefully with his family by his side on 09.04.2019. A larger than life presence, who made us all laugh endlessly. We miss you and love you so much Pop. 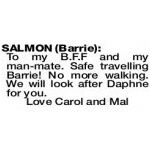 SALMON BARRIE To my B.F.F and my man-mate. Safe travelling Barrie! No more walking. We will look after Daphne for you.